Our largest air bath 72×72 is truly spectacular! At 72 inches by 72 inches along the wall sides this tub is expansive! With a seat in each of the three corners bathers can relax in several configurations with plenty of room to stretch out and enjoy hot water therapy together. It’s like having a small spa in your bathroom! Our largest air bath 72×72 is truly spectacular! At 72 inches by 72 inches along the wall sides this tub is expansive! 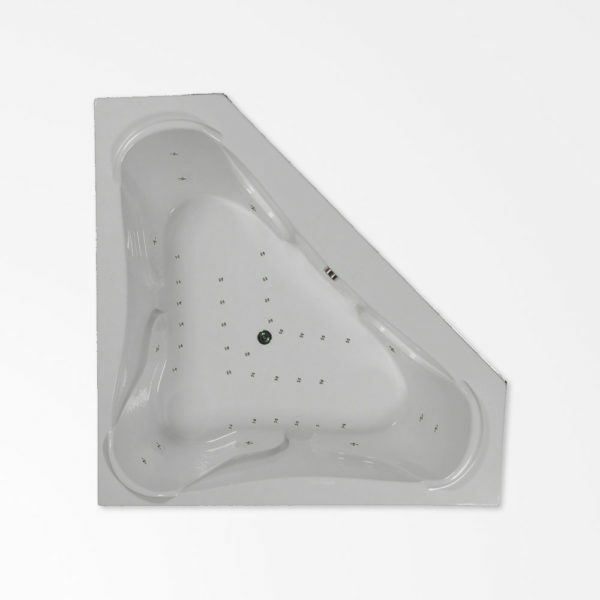 With a seat in each of the three corners bathers can relax in several configurations with plenty of room to stretch out and enjoy hot water therapy together. It’s like having a small spa in your bathroom! Take a close look at the photo and you’ll see that each corner seat has a raised molded in acrylic headrest and armrests assuring there’s no bad seat in the model 72X72 tub! And since the seats are triangular in layout you can sit either shoulder to shoulder or face to face with plenty of room for arms and legs. Use the 72X72 when space is no object. It will fill a corner with luxury and beautiful styling and make your new bathroom stand out from all the others you’ve ever seen. It has 43 air injectors and a one horsepower pump as standard equipment so get ready for spa like therapy right in your bathroom! When only the best will do, this tub fills the bill. Make it the focal point of your new bath and you’re sure to impress. This tub has it all.